(Bonhoeffer) refused to recant, and defiled the Gestapo machine by openly admitting that, as a Christian, he was an implacable enemy of National Socialism and its totalitarian demands the citizen–defiled it, although he was continually threatened with torture and with the arrest of his parents, his sisters and his fiancée, whom all had a helping hand in his activities. ~ Memoir by G. Leibholz in Dietrich Bonhoeffer, The Cost of Discipleship, 1961 edition, 26. …in his (Bonhoeffer) hearing before the Gestapo during his imprisonment, defenseless and powerless as he then was and only fortified by the word of God in his heart, he stood erect and unbroken before his tormentors. On February 13, 2012, Washington became the 7th State in the Union to legalize gay marriage, but the fighting is far from over. Just this past week, North Carolina became the 30th State in the Union to pass a constitutional amendment that affirms the definition of “marriage” as a union between a man and a woman. With all of these fast-moving and significant changes in the culture, I find myself compelled to write this article. I say compelled because my hesitancy to write about gay marriage comes from the fear that this single topic will be used to create a caricature of my faith. I am also keenly aware of the anger this discussions evokes in some people. Despite these concern, I find it necessary to speak out for the middle road that does not get much attention in the press. The issue of gay marriage and Christian Faith is not going away and will continue to shape the public debate. Every church in America will at some point be forced to take a stand on this issue one way or the other. After much internal struggle, here is where I stand. I believe that all life is precious to God, but to hear some people tell it, anyone who accepts the traditional teaching of the Scripture that marriage was designed by God as the union between one man and one woman is a “hateful bully.” This column by Frank Rich entitled, “Smoke the Bigots Out of the Closet” is just one example of the hyperbole that passes for intelligent discourse. It is my hope that in the near future, reason will win out, and people on all sides will recognize that we can have religious, philosophical, political, and even scientific disagreement without resorting to name-calling. This, to me, is the most fundamental point to the issue of gay marriage—Christianity is decidedly apolitical in its nature. My Faith, as defined by Jesus, the Apostle Paul, and the New Testament, is not Political, but only concerned with taking the Good News (Gospel) of Jesus to those who do not have it. Jesus refused to establish himself as a political leader and his first Apostles followed his example. Barack Obama is the most recent example of how Faith, when politicized, ceases to be Faith at all. In his first Presidential election of 2008, Obama needed to gain mass appeal, so at the time his “faith” led him to reject gay marriage. 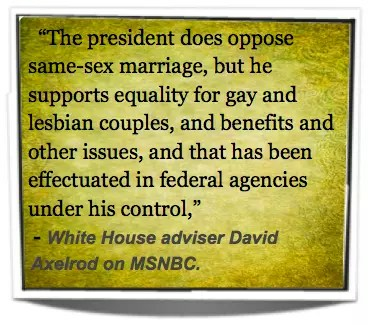 In 2010, Obama was still publicly opposed to gay marriage. Now in 2012, the economy is in disarray and jobs are hard to find, so Obama’s ever-evolving-faith tells him to go for the money and throw his political power behind gay marriage. Clearly, the change we can all believe in is that when religion become a political tool—genuine Faith is subverted by lust for political power. Many people conflate the Old Testament, which tells the history of the Jews, with the politics of America. Simply put, The Old Testament theocracy and Torah (Law) were meant to bring Israel to the realization that no Law can make the heart of Mankind righteous. The Law of the Old Covenant between God and Israel illustrated that no legal system can make people holy. Each person needs to be remade, through Jesus Christ, into the Image of God; not remade into the image of government. Faith in Jesus, recognizes that no matter how good a nation’s laws, they are not enough to change the heart of Her people. It is the great irony of American-Evangelicalism that so many people believe that passing a law to prohibit gay marriage will keep the country “pure.” But even God, with his perfect Law (Torah), could not purify Israel. This is why so much of the Evangelical fervor against homosexual marriage makes no sense. It is an attempt to live out a Legalistic faith instead of an Evangelistic one. Christianity is not political, yet we are blessed by God to live in a democracy. Out of respect to the political powers in authority over us, I believe every Christian has an obligation to vote their conscience. However, there are two caveats to this point. First, I do not find any foundation in the teachings of Jesus or in the teachings of the New Testament that allows me to compel others, by use of political power, to observe my convictions. It does not fit with my Faith to endorse or create any “Christian” Political Action Committees to support or oppose gay marriage. I do not think it is of any value to donate money to candidates who share my faith. I do not support advertisement campaigns to “raise public awareness,” engage the “culture war” or persuade people to vote for or against gay marriage. I do not put up Yard Signs that condemn others for their sin. 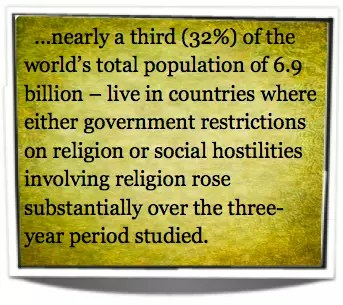 These methods satisfy a political agenda, not the Christian mission. You’ll have to wait until Tuesday to hear the full Focus on the Family radio interview (listen here) with Bono regarding Jesus, the Psalms, PEPFAR, and The ONE Campaign’s success in fighting global poverty alongside faith communities. 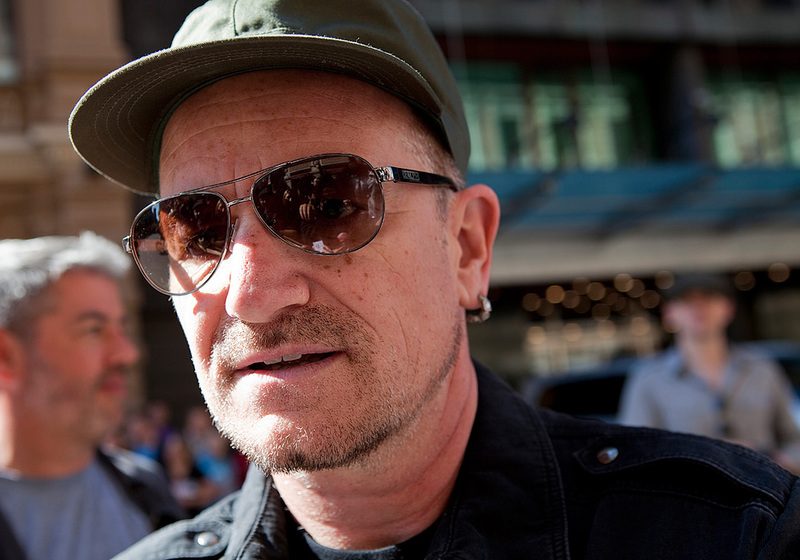 Bono: I don’t have a lot of memories of her, which is [an] unfortunately situation. … I look forward to meeting her again. But the loss of that is significant for [a child], and for me, I filled it with music and … and it deepened my faith, I suppose. Daly: So often those that struggle with accepting Jesus Christ as their savior … it’s the idea that he’s the Messiah. … How did you respond to that? Bono: Jesus isn’t lettin’ you off the hook. The Scriptures don’t let you off the hook so easily. … When people say, you know, “Good teacher”, “Prophet”, “Really nice guy” … this is not how Jesus thought of Himself. So you’re left with a challenge in that, which is either Jesus was who he said he was or a complete and utter nut case. … You have to make a choice on that. That Bonhoeffer, having entered the resistance, became one of its leading figures, is not surprising; he was capable of brilliant leadership, trust and rare courage. That he entered the resistance at all is most surprising! ~ William Kuhns, In Pursuit of Dietrich Bonhoeffer, 222. Do the ends justify the means in the case of Edward Snowden disclosing classified NSA secrets to the world via the UK’s Guardian newspaper? I think not. Over the past week, worldwide media offered numerous stories covering various aspects of the NSA Prism program, along with differing views regarding how the Top Secret program became public knowledge. There were details about “bigger, bolder data seizures” as well as how a banned USB thumb drive was used to get the information off of classified computer systems by Edward Snowden. Was Snowden a whistleblower or double agent? There were even public rallies in Hong Kong in support of Snowden. NSA employees and contractors are given a rare privilege and unique trust by our nation. Just as everyone in a hospital operating room is trained to know their role to save lives, everyone at NSA is taught the importance of their part in the vital mission. “Security is our middle name” was our motto. Genuine integrity was paramount. “No comment” was the answer given to press. If anyone had concerns about a policy or procedure, there were always clear, appropriate processes for handling such complaints. Edward Snowden chose to break his pledge, not follow process, and violate our nation’s trust. I must say that this poll result surprised me. Even if you agree with Snowden’s arguments regarding Prism’s violation of personal privacy protections, which he described in the UK Guardian interview embedded below, does that make it acceptable for him to release confidential information to the press? Perhaps you are worried about the USA becoming a “surveillance state” and/or you’re glad that this NSA Prism program has now been made public. You may feel that this topic now needs to be debated openly. Furthermore, even if I partially agree and share some concerns for future monitoring and government intentions, our privacy protections going forward and potential misuse of the information down the road, I still don’t believe that the end result of Snowden’s disclosures justify his illegal actions. My mother-in-law and I disagree on this topic. As a libertarian champion for smaller government and individual freedoms, she defends Snowden (at least for now until more is known.) She is angry about what our government is doing, and she thinks NSA has become too powerful and is wrong. We had a polite debate on the topic on Saturday morning. While I agreed with a few of my articulate mother-in-law’s arguments, I expressed a half dozen or more ways that Snowden might have been a true “whistleblower.” It would have started with following DoD procedures for such things, rather than running to the UK’s press and causing significant damage to our country, our security and U.S. businesses. She asked me questions like, “Do I think it would ever be right to go around all of the normal processes and safeguards that are put in place at NSA? Would I ever do the same thing, if I was in his shoes? I paused, and thought for a minute. My answer would almost always be no. While one never knows for sure how they would act if forced to walk a mile in another’s shoes, I would work through the appropriate DoD controls and procedures 99.99% of the time. Nevertheless, a rare exception did come to mind. If I was convinced that laws were constantly being broken or, God forbid, crimes against humanity were being performed by management, I would (hopefully) act outside the normal ‘whistleblower’ process – if that’s what it took. In my view, this bar was not reached in the Snowden case, since he was the one who revealed the court decisions authorizing the program with privacy protections in place for content. 1. The English word Bible is derived from the Koine Greek τὰ βιβλία (ta biblia – “the books”). While Christian use of the term can be traced to around A.D. 223, the late biblical scholar F.F. Bruce noted that Chrysostom in his Homilies on Matthew (between A.D. 386 and 388) appears to be the first writer to use the Greek phrase ta biblia to describe both the Old and New Testaments together. 2. The word “testament” (Hebrew berîth, Greek diatheke), means “covenant.” The term “Old Testament” refers to the covenant which God entered into with Abraham and the people of Israel, and “New Testament” to the covenant God has entered into with believers through Christ. 3. The practice of dividing the Bible into chapters began with Stephen Langton, an Archbishop of Canterbury in the early 13th century. Robert Estienne, a 16th-century printer and classical scholar in Paris, was the first to print the Bible divided into standard numbered verses. 4. The first complete Bible printed in the Western Hemisphere was not in English or other Europeans languages. The “Eliot Indian Bible,” published in Cambridge, Massachusetts, between 1660 and 1663, was a translation in the Natick dialect of the Algonquin tribe of indigenous Americans. There were no English language Bibles printed in America until the late 1700’s, mainly because they were more cheaply and easily imported from England up until the embargo of the Revolutionary War. 5. The first red-letter New Testament (i.e., words of Christ printed in red) was published in 1899, and the first red-letter Bible followed two years later. The idea of printing the words of Christ in red originated with Lous Klopsch, editor of Christian Herald magazine, who got the idea after reading Jesus’ words, “This cup is the new covenant in my blood, which is poured out for you” (Luke 22:20). 6. The Bible is not only the best-selling book of all-time, it is consistently the best-selling book of the the year, every year. (Even in 1907, the New York Times noted that the “daily sales of the Bible, 40,000 copies, exceed the annual sales of most popular novels.”) Currently, an estimated 25 million copies are sold or distributed in the U.S. every year, approximately one new Bible for every 12 Americans. Dietrich Bonhoeffer: There is Great Joy When Christians Get Together! The physical presence of other Christians is a source of incomparable joy and strength to the believer . . . It is true, of course, that what is an unspeakable gift for the lonely individual is easily disregarded and trodden underfoot by those who have the gift every day . . . Among earnest Christians in the Church today there is a growing desire to meet together with other Christians in the rest periods of their work for common life under the Word. Communal life is again being recognized by Christians today as the grace that it is, as the extraordinary, the “roses and lilies” of the Christian life. To Bonhoeffer, Christianity was not the concern of the believing, pious soul who shuts himself up and keeps himself within the bounds of the sacramental sphere. No, according to him Christianity has its place in this world and the Church as the Body of Christ, and the fellowship in him can only be the visible Church. Man must follow him who has served and passed through the world as the living, the dying and the risen Lord. Therefore, wherever it pleases God to put man in this world, the Christian must be ready for martyrdom and death. It is only in this way that man learns faith. ~ Memoir by G. Leibholz in Dietrich Bonhoeffer, The Cost of Discipleship, 1961 edition, 24. I. Gracious God, the Beyond in the midst of our life, thou gavest grace to thy servant Dietrich Bonhoeffer to know and to teach the truth as it is in Jesus Christ, and to bear the cost of following him: Grant that we, strengthened by his teaching and example, may receive thy word and embrace its call with an undivided heart; through Jesus Christ our Savior, who liveth and reigneth with thee and the Holy Spirit, one God, for ever and ever. Amen.